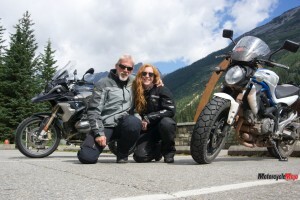 As luck would have it, our daughter, Emily, was visiting Ontario from British Columbia for a couple of weeks last summer, and fortunately the last time she was here, she had left her Suzuki SFV650 Gladius behind. Her plan was to ride it back west when she headed home, and she wondered if I’d be interested in riding part way back with her. I’d have been a fool not to accept her invitation, so I jumped at the chance to go on an extended ride, considering earlier that year I underwent shoulder surgery that involved a six-month recovery period. 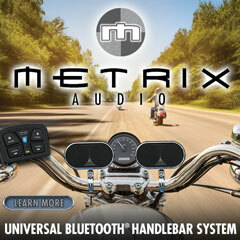 That meant no motorcycle riding until the end of August. 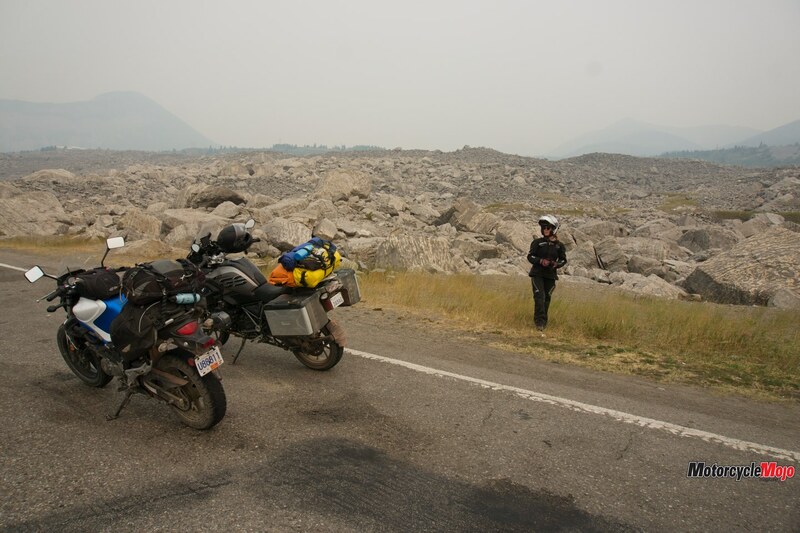 It had been seven years since we had done a similar trip, when we rode west via South Dakota to Revelstoke, B.C., where she lives. We took this route because I wanted to show her some of my favourite roads in the Black Hills National Forest. We had a break in our Mojo schedule and I told my wife, Gwen, I’d be back in time for the next issue. I didn’t know how long I’d tag along with Emily, but we had made a very general plan of attack that basically consisted of heading west and staying off the Trans-Canada Highway as much as possible. Who needs more detail than that? 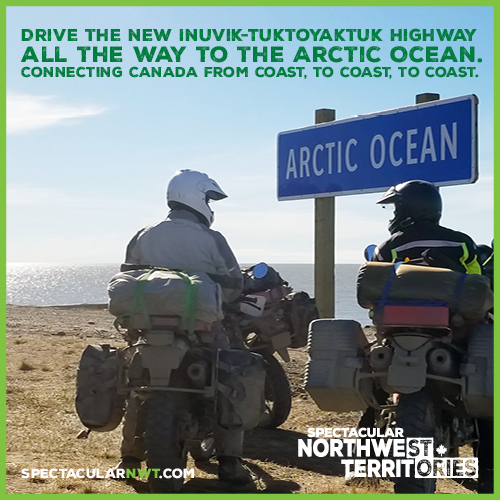 I’ve been across the country a few times by motorcycle and I’d be the first one to agree that the Trans-Canada is good for moving people. 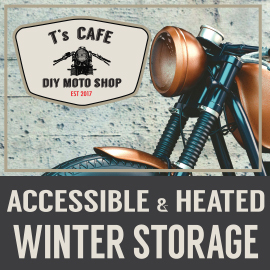 There is nowhere in that description that says it’s entertaining for the motorcycle rider, although there are some exceptions that are worth the experience – between Banff, Alta., and Sicamous, B.C., comes to mind – but for the most part, the exceptions are few and far between. With map in hand, Emily would be our navigator. 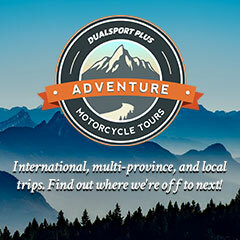 In my cross-country travels, I’ve ridden both on and off the Trans-Canada, but this trip with my daughter would turn out to be vastly different from any of my previous rides west. Keeping in mind our very loose plan, we were to leave eastern Ontario on the Thursday, but that turned into a noon-ish departure on Saturday due to some electrical gremlins in Emily’s bike. Clearing up some out-of-the-way loose ends forced us on the Trans-Canada in order to make up some lost time. It wasn’t a perfect start, but we were on the road nonetheless. Leaving New Liskeard, Ont., the second morning of our adventure meant it was time for backcountry riding. We continued westward at the end of County Road 560 as it turned from pavement to gravel, and unbeknownst to us, this is what much of the trip would consist of. Our only plan was to head west on as many secondary roads as we could find. This 80 km stretch of gravel that would take us almost to Chapleau turned out to be a private road belonging to a logging company but open to the public. In other words, watch out for logging trucks. I was fully committed to taking my own Triumph Tiger 800 XC, but during a last-minute, unrelated conversation with Rob Dexter at BMW Canada, he offered a 2018 R1200GS demo that was eager for a ride. The GS is an amazing all-around bike that handles anything you can throw at it, and it took on that stretch of gravel without skipping a beat. Emily is as happy riding on pavement as she is on gravel or taking on single-track in the bush. 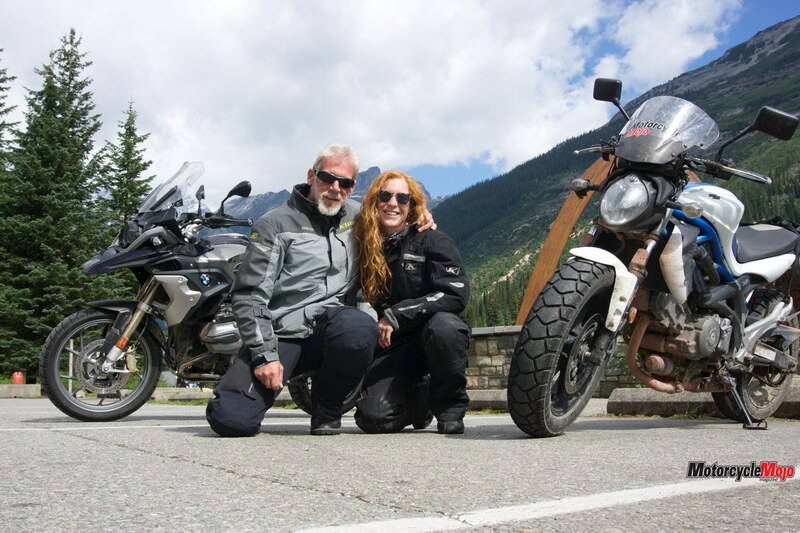 While she is no stranger to taking her street bike up mountain logging roads in B.C.’s Interior on street tires, she recently installed a set of oversized Heidenau K76 dual-sport tires, giving her more traction on loose terrain. I don’t think there is anything that would stop her from going where she wanted to, regardless of tire style. 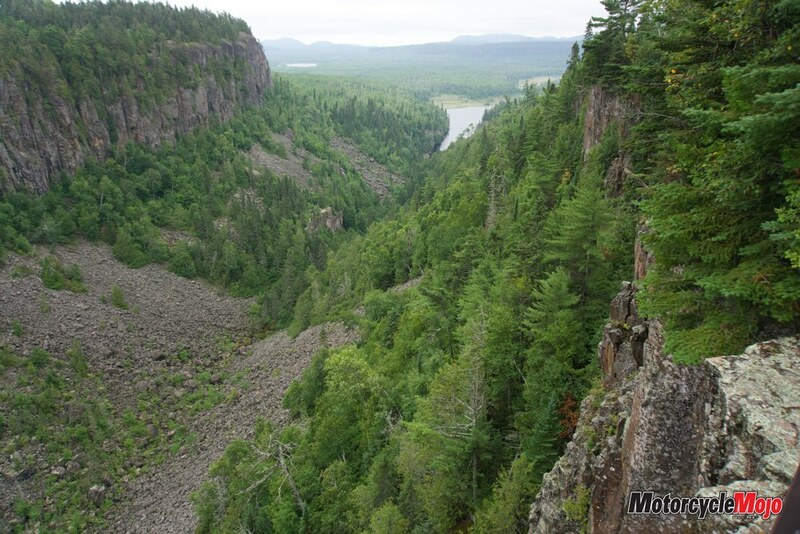 The Canadian Shield – which created the rocky shoreline of thousands of lakes and islands, some of which are barely big enough to hold a single, windswept pine – had been prevalent for most of the trip so far, and contributed to the rugged, beautiful scenery that northern Ontario is famous for. On the opposite end of the scale was the monotony of the vast tracts of forest for hours on end. After Wawa there aren’t any road options heading west other than about 1,000 km of Trans-Canada until you get to the Manitoba border. And it can be desolate, so be sure to get fuel when you have the chance. After Thunder Bay, we stayed off the truck route and took Hwy 11 toward Fort Frances, and then Hwy 71 through Lake of the Woods to Kenora. 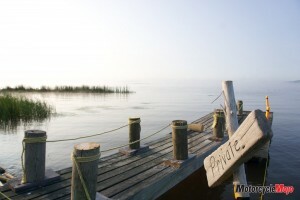 Lake of the Woods is another beautiful ride, but again, lots of forest and some long, desolate stretches with just the occasional driveway for a wilderness lodge or a hunting camp. There are a couple of opportunities for fuel on the 150 km stretch of road, though. It’s possible to take a shortcut through Minnesota before getting onto Hwy 71 that could shave off a bit of time, but the border crossing might use up any time saving. My intention from the start was to not go into the States, but the unpredictability of the massive wildfires in B.C. 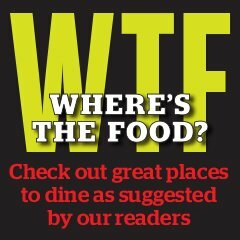 could have possibly blocked our way and forced us south of the border. 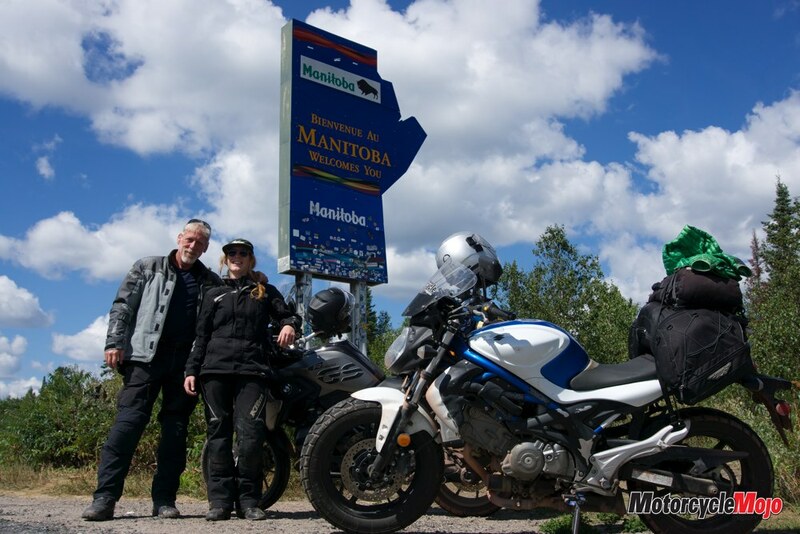 After three and half days just to get out of Ontario, Emily noticed our first realistic exit off the Trans-Canada and onto Hwy 44 just inside the Manitoba border. This road would allow us to bypass Winnipeg and drop us back onto the Trans-Canada west of the city, alleviating the ring road and the traffic that goes along with it. Highway 44 was a fun road full of twists and turns, but the pavement was in pretty rough shape for much of it. Emily made do on her Gladius dodging potholes and frost heaves, while the GS took it all in stride. 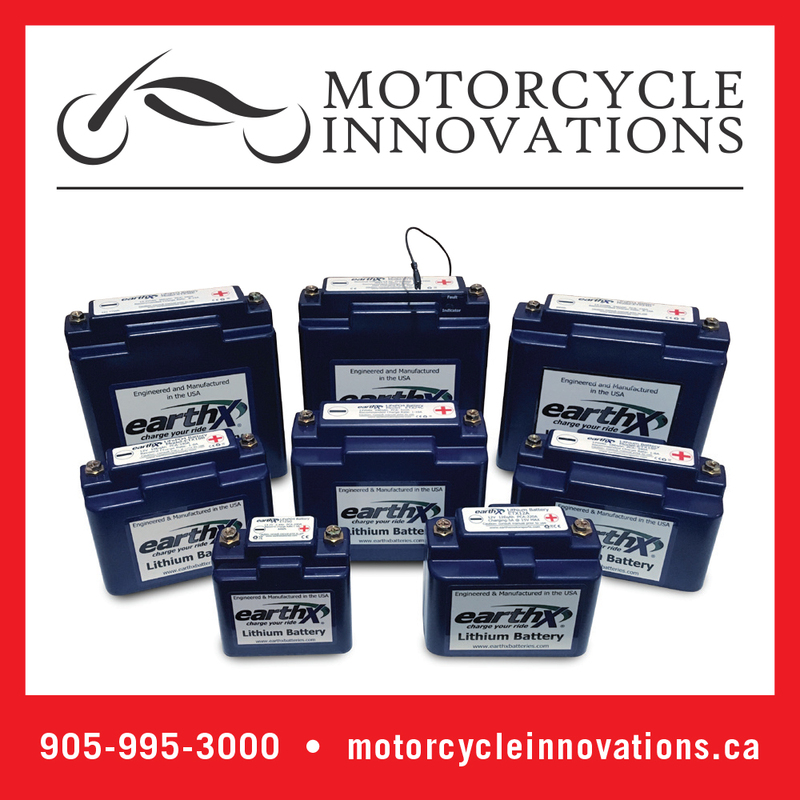 My demo GS came with Dynamic Electronic Suspension Adjustment, which adjusts spring preload and damping on the fly according to surface conditions – it always delivered a smooth ride. 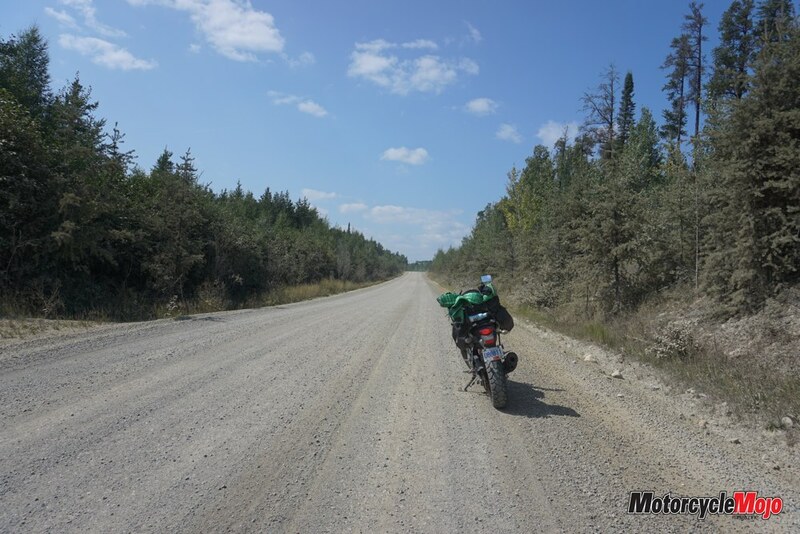 During our zigzag back to the Trans-Canada, we came across more long stretches of gravel that were bone-dry and extremely dusty. I took the lead and Emily stayed way back to allow time for the dust to settle. 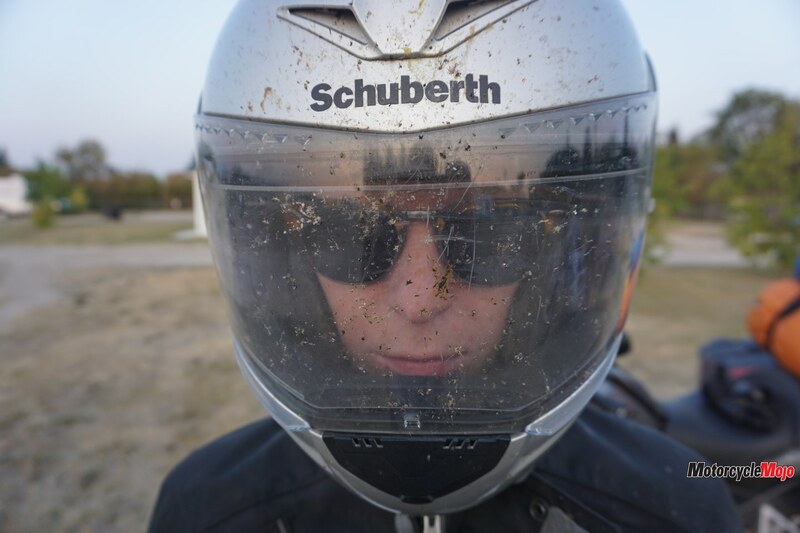 The road was centre-bare with two skimpy additional tire tracks on each side of semi-hard-packed gravel, but the gravel was loose and about 20 cm deep between the tire tracks. The traffic was light, but when a vehicle would approach, moving over through the very loose gravel took extreme caution. At one point, Emily caught up to me as I waited for her at a stop sign and she enthusiastically yelled out, “I almost biffed it so many times!” It’s funny what gets some people excited. 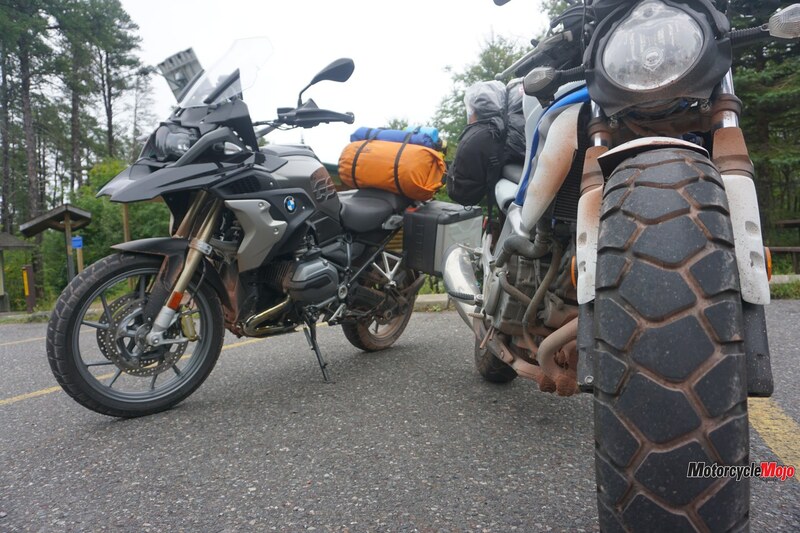 I just put the GS in Enduro mode, which softens the throttle response, adjusts its traction control for loose terrain and retains ABS on the front wheel while allowing the rear tire to lock up – it was perfect. Once back on pavement, changing to Road or Dynamic mode was easy as pushing a button on the right switchgear and gave me responsive access to all 125 ponies. 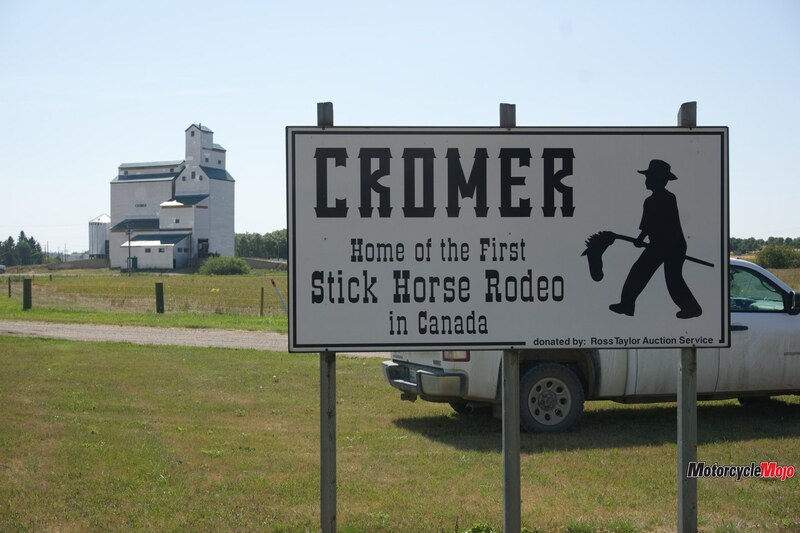 We had only been on the Trans-Canada for about 15 km when we stopped in a small town called Elkhorn and set up camp at the local fairgrounds, which used the honour system via an inconspicuous box on a fence post. I have no problem at all supporting these kinds of places and appreciate the effort the town puts in to keep the area open to travellers. It was $15 well spent. I think we met all of Elkhorn’s residents at the town’s only café the next morning. As it turned out, that last short stretch of Trans-Canada would be the last time we’d be on the highway for the duration of the trip. Many people find the prairies boring but I didn’t. As mentioned earlier, I found northern Ontario very monotonous because of not being able to see anything except for forest. 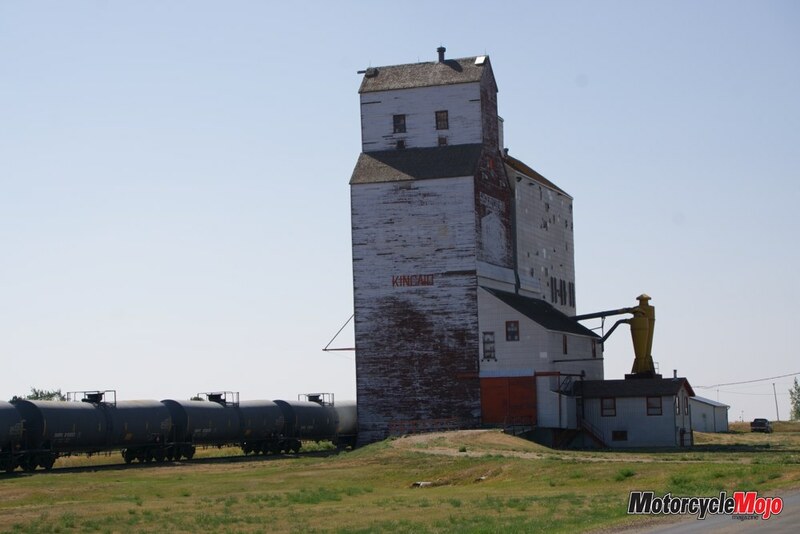 On the prairies you can see to the horizon – farmers working the land, herds of livestock, fields of golden wheat or yellow canola swaying in the breeze, and hay bales that fade in the distance to the size of pinheads. It helps to keep yourself entertained by making a game out of it, like determining the percentage of black cows to brown cows, or wondering how far a grain elevator is off in the distance and taking note of your odometer to see how close your guess is. (The latter game only worked once in a while, though, since it took so long to get to the elevator, I was forgetting to check the odometer when I’d reach it because a hundred other “games” had already played in my head.) 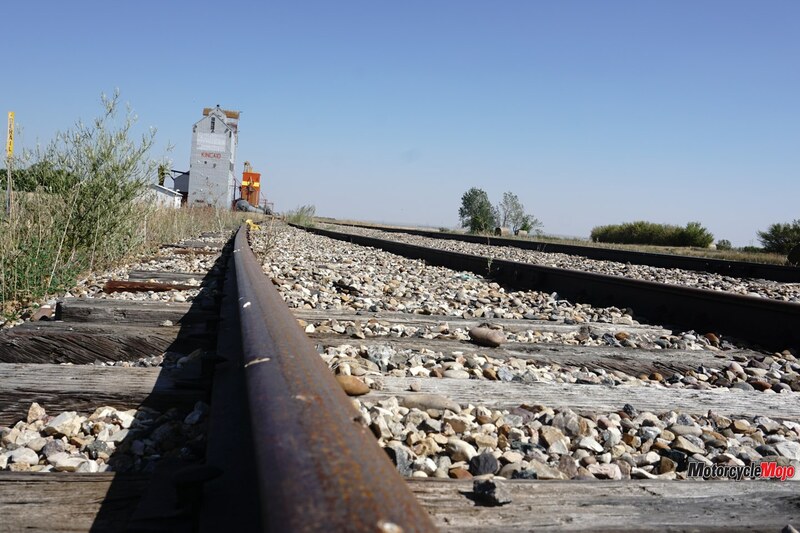 I counted 178 rail cars as we crept past a train traversing the prairies. 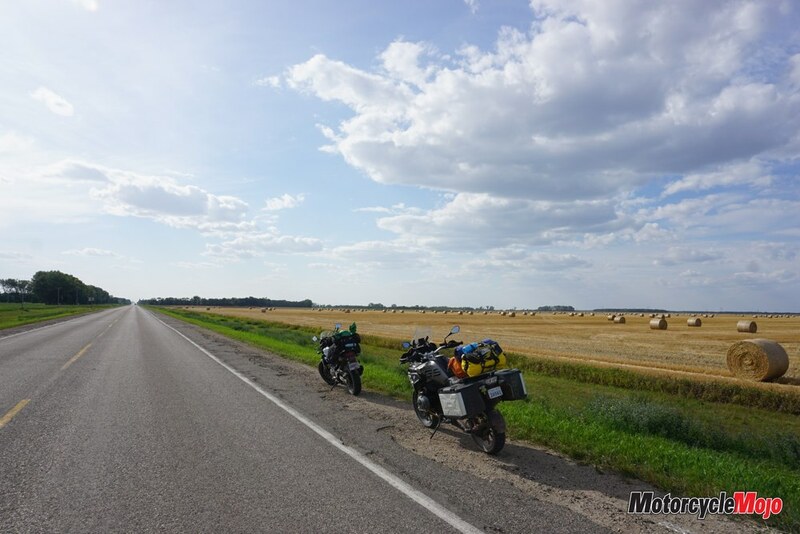 By the time we got about a third of the way across Saskatchewan on Hwy 13 (the Red Coat Trail) and the town of Pangman, I was getting tired of arrow-straight roads. We had passed through a lot of one-horse towns, most of which I think the horse had already left town. Pangman was slightly bigger than those with maybe two or three horses at one time. The exceptionally faded sign in front of the Wild Horse Café drew us in – and the fact that it was the only place in town to stop for lunch and a look at the map. Judging by the barely legible sign, the place had been there forever, but to our surprise, it was run by a young Asian couple, and the Chinese food they offered was remarkably tasty. Is That a Curve Up Ahead? After hours of straight road, I was excited to see a curve on the map just west of town, and then another one, and another. I was developing a flat tread on the GS’s Michelin Anakee III tires and was looking forward to hopefully giving them a radius again. This is where a paper map earns its keep – to see the big picture of what might be happening in the near future. Unfortunately, maps can also be deceiving. At curve number eight we had ridden about 200 km. I was ready to move on from the flatlands. Luckily for me, the GS is a comfortable machine to spend several hours on. 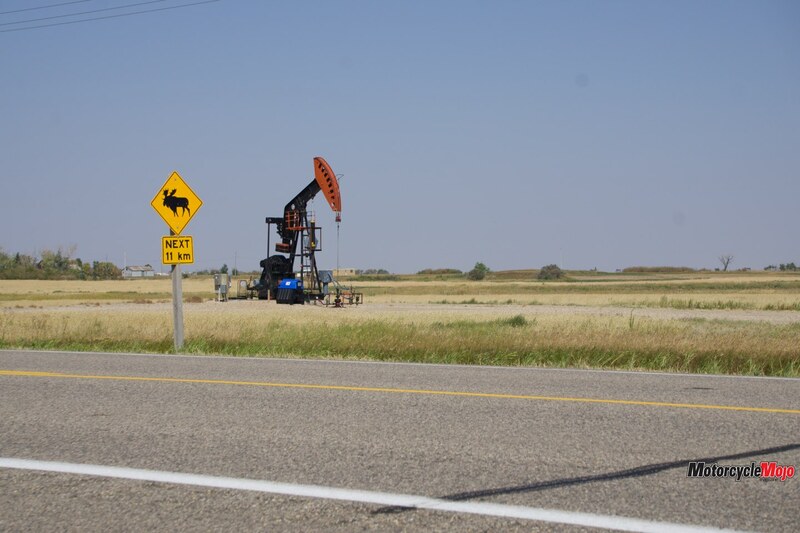 I found it strange to see passing lanes in the prairies, thinking they were mostly used for long hills that slow down transport trucks in other provinces. I also saw “Watch for moose” signs. I had only ever seen these in northern, heavily forested areas, and never thought they would be on the wide open flatlands where you could see a moose coming for hours before you actually had to take evasive action. 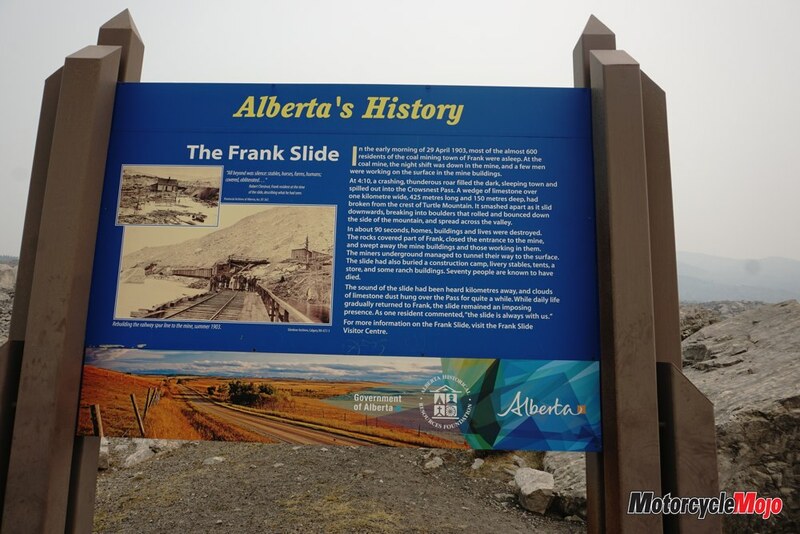 Thankfully to alleviate the boredom were the hundreds of kilometres of gravel road we encountered, and once around Frenchman River Valley, you would no longer think you were in the prairies, as it was reminiscent of the Badlands area of Drumheller, Alta. 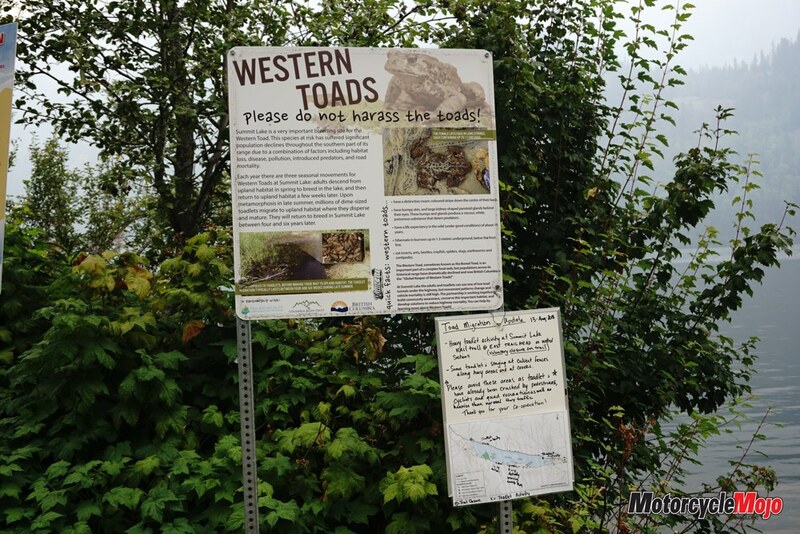 I had ridden through this area on a prior trip and was as impressed then as I was this time. 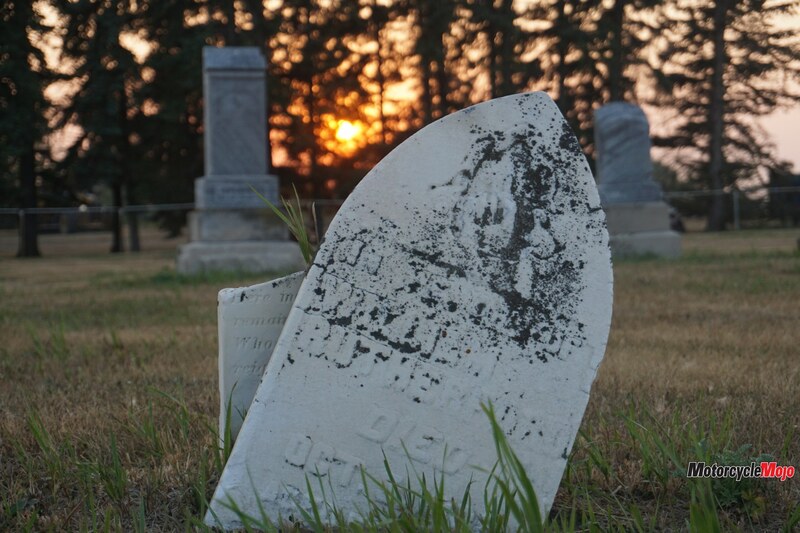 We welcomed this break in the flatlands as much as the hospitality that small-town residents offer. Emily and I were both running on fumes, and a co-op store owner was nice enough to open up her gas pumps for us after the store had already closed. 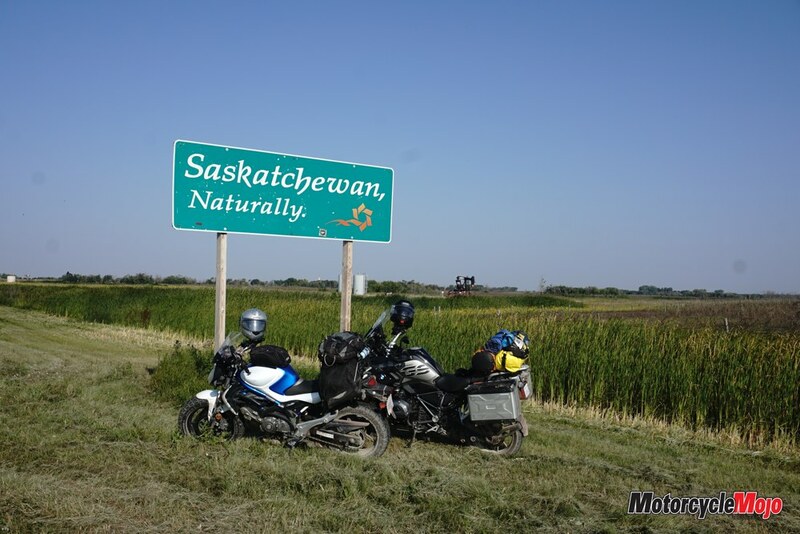 Most of the provinces seem to be proud of the border crossing, with substantial signs announcing your entry into that province, but the sign leaving Saskatchewan was several times larger than the sign announcing Alberta, which was essentially no bigger than a common street sign. In all fairness, we were on a skinny gravel road with no fences, and signs warning of free-range livestock. We were in the middle of nowhere and couldn’t have explained to anyone where we were, but we weren’t lost. We were following the setting sun, and that’s all that mattered. 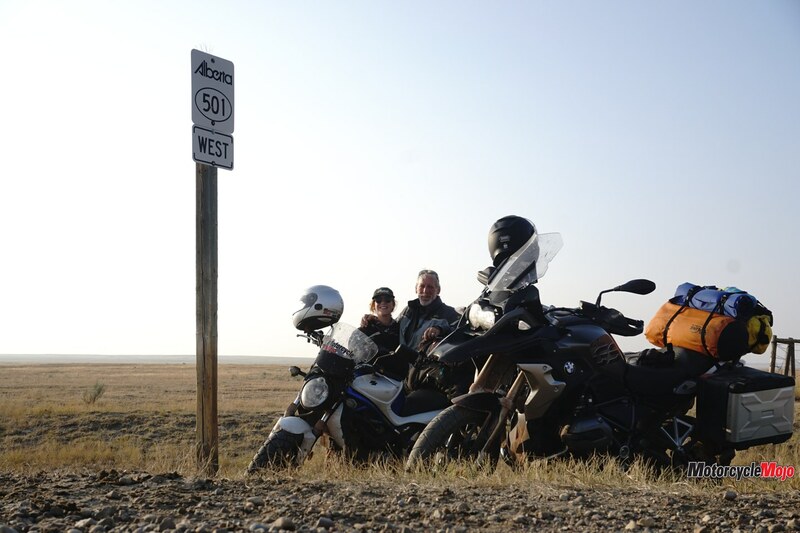 It was cold when we rolled into Lethbridge at around 10 p.m. – much later than we anticipated. That evening in southern Alberta, we began to see deer and antelope fairly regularly, and I knew it was a concern to Emily. It was seven years earlier when we rode west together that she hit and killed a deer on a rainy, pitch-black night in South Dakota, and she has tried to avoid riding at night ever since. She was on her Gladius then, too. Good brakes are important at any time, but we once had to brake hard to avoid hitting a few antelope that had darted out from the ditch in front of us. The pair of Brembo four-piston radial calipers on the front of the GS offers immense stopping power, and at that time I was grateful for ABS. We realized the following morning that the setting sun that had hung on the horizon like a massive fireball the night before was so magnificent because the smoke haze seemed to magnify it. This morning was our first realization that we would be now riding in wildfire smoke for the rest of the trip. On Hwy 3 just outside Lethbridge, I could barely make out the shape of a mountain against the sky and wondered what the visibility distance was. I took note of the odometer and it was only 3 km, give or take, until we were beside the mountain. And visibility continued to worsen the farther west we went. Highway 3, the Crowsnest Highway, is a fantastic road as it leaves southern Alberta and continues through southern B.C., and a stop at the Frank Slide is both unbelievable and sobering as you view a valley of mammoth boulders left behind after the side of Turtle Mountain let go in 1903 and buried some 90 residents under 110 million metric tonnes of rock. 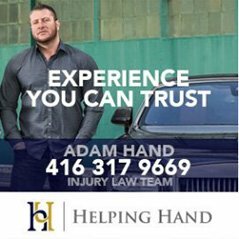 It remains Canada’s deadliest rockslide. It was obvious that the smoke was definitely pushing the animals out of the forest. We spotting more deer before reaching Cranbrook, B.C., and even saw one walking on a sidewalk in town. 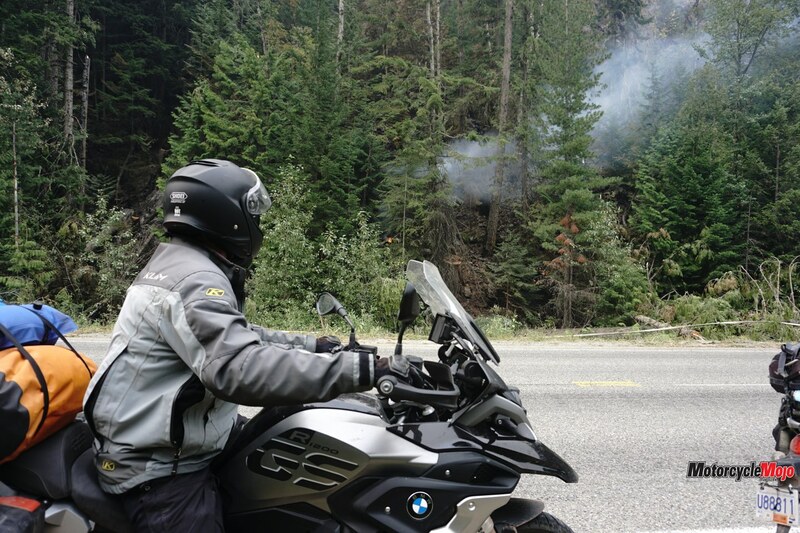 In fact, Emily and I were riding between Cranbrook and our night’s destination of Nelson when we came upon a small fire just starting at the roadside, no doubt started from a spark from a fire just 100 metres ahead that was fully involved on a large hillside. We could feel the intense heat from it as we rode by. We were constantly checking drivebc.ca for road closures due to the fires. We left the unique and historic city of Nelson for a relatively easy ride on our last day to Revelstoke. 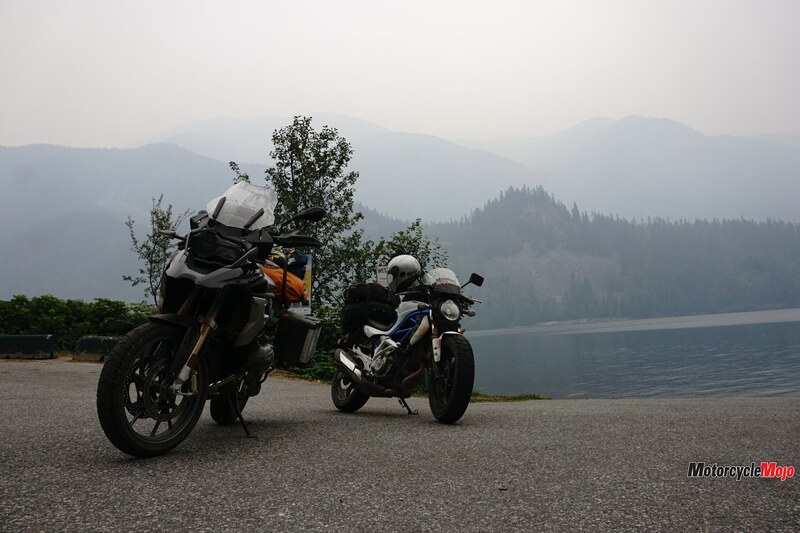 Nestled between the Selkirk and Monashee mountain ranges, Revy is surrounded by mountains, but because of the smoke, I couldn’t see a single one. I felt sympathy for all the people who were displaced or who lost everything due to the devastating wildfires of 2018. 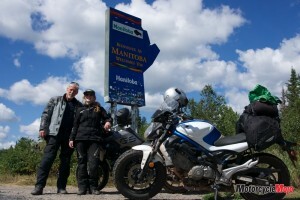 Overall, it was amazing to chase the sun with Emily again on this seven-day, 4,400 km ride west. 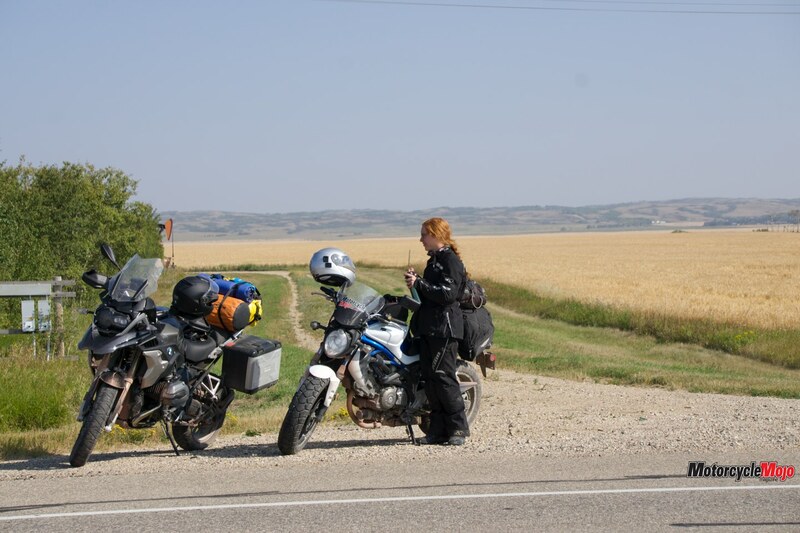 Based on her navigation, we figured we had ridden approximately 2,200 km of secondary paved roads, 1,000 km of gravel roads and 1,200 km on the Trans-Canada Highway – the last only because at times there was no other option. At this point, my trip was only half over. I stayed in Revy for two days before turning around and heading back home.